(1) Henry Reeve Nicholas (1885-1946), was the son of George Henry and Florence (Reeve) Nicholas. He was born and later died at 'Reeveland' just south of Scottsville in Buckingham County, Virginia. Called "Reeve", he was a farmer and rural mail carrier in Buckingham. He was something of a non-conformist, and for his day, a free spirit. Reeve read a great deal, loved to hunt, and was a naturalist. Reeve married first, Frances Horsley as shown above, and after her death, he married Frances Clay Ludlam (1889-1967) in 1921. Reeve Nicholas is buried at Scottsville Baptist Cemetery. (2) Frances Eldridge Horsley was the first wife of Reeve Nicholas. Frances died shortly after the birth of their son, Henry Reeve Nicholas, Jr., in 1916. 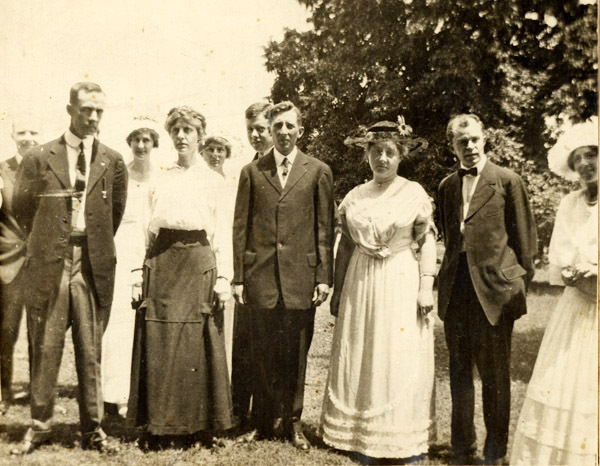 (3) James F. Dorrier of Scottsville served as best man for Reeve Nicholas at this wedding. James was the son of William and Catherine Ann (Ritchey) Dorrier, who owned and operated Mt. Pleasant Farm near Scottsville. James married Sarah Carrington. (4) Mildred Horsley, sister of Frances Eldridge Horsley. (5) Thomas Ellison Bruce married Mary Browne and was a pharmacist by education. Later Tom served as Mayor of Scottsville. (6) Annie Fontaine Nicholas (1887-1975) was the daughter of John Walter and Annie E. (Fontaine) Nicholas; she was the first cousin of Henry Reeve Nicholas. This photo is part of the Richard Ludlum Nicholas collection. 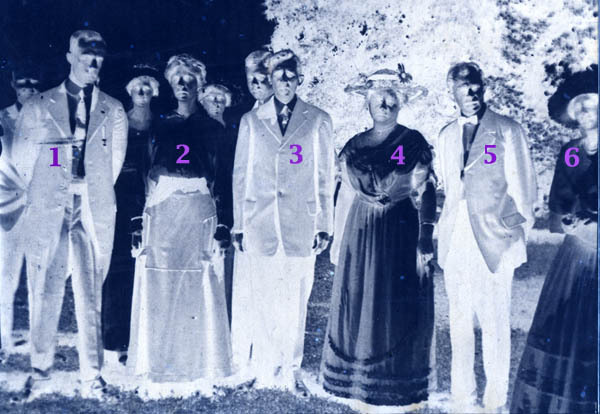 In addition, the Nicholas family genealogical information, used in this photo's description, comes from Richard's book, The Nicholas Family of England and Virginia (1988). Richard resides in Charlottesville, Virginia, and is the son of Henry Reeve Nicholas and Frances Clay (Ludlum) Nicholas.